We use a proprietary QPQ Salt Bath Nitride finish also commonly referred to as Melonite, Tenfer, Nitride etc… these are all QPQ Salt Bath Nitride finishes which make the entire Breacher 80 RC and super slick and Tactical black. The Nitriding also gives it a super black luster with a low coefficient of friction this treatment produces an extremely hard, slick surface that resists carbon adhesion and increases corrosion resistance, extending the service life. 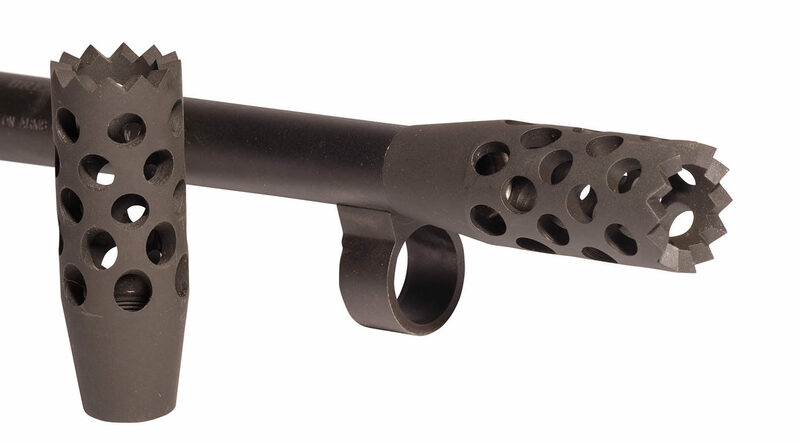 So when you out blasting 1000s of rounds you never have to worry about your Breacher being damaged by hot gases, corrosion or the doors they come in contact with. Please send only the barrel to Royal Arms. Please include your Business card or purchase order with a a return address and provide clear instruction as to what you want done & specify the Overall length. Royal Arms will always be 100% USA made, with USA material and USA ingenuity. We don’t just say we make it, we actual do. We encourage you to stop by our shop and see for your self American pride in manufacturing and American Ingenuity at work.